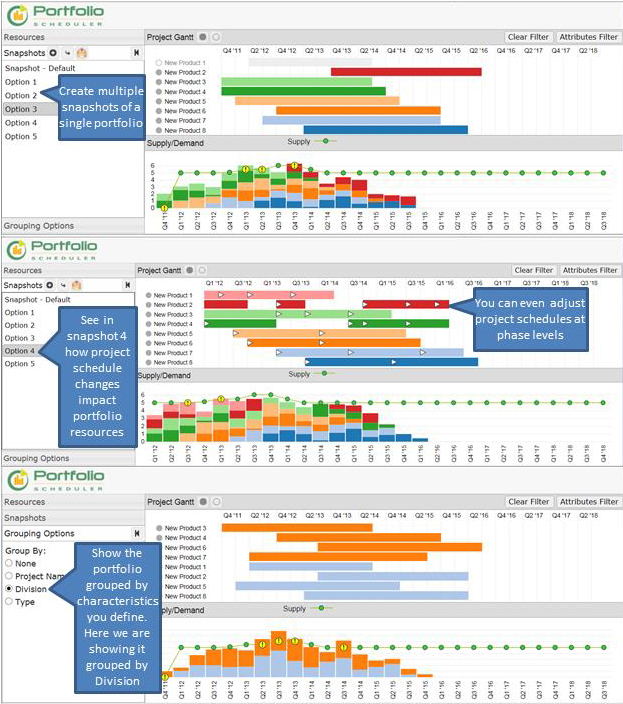 Portfolio Scheduler is a new and exciting Enterprise Portfolio Simulator (EPS) feature that helps organizations make better decisions by facilitating rapid what-if scenario development. ProModel is proud to introduce this new feature at Microsoft Project Conference 2014 #ProjConf. After you simulate a Portfolio in EPS, you can simply visualize the portfolio in a single view. See the impact of projects schedules on your constrained resources. More work than your resources can handle? Click and drag to change project schedules. This entry was posted in General Simulation, PPM Strategies and tagged business analytics, capacity planners, Consulting, enterprise performance, opportunity definitions, portfolio and capacity planning, portfolio management team, predictive simulation, promodel, simulation products, simulation solutions, simulation toolset, software, strategic planning, Team ProModel, technology. Bookmark the permalink.